Mobile storage makes moving school supplies and equipment from room to room easy. There a few things to think about before you purchase a mobile storage cabinet, mainly: material, door style and type of shelving. 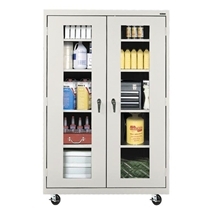 Mobile storage cabinets are typically made of steel, hardwoods or laminate. Steel is exceedingly strong and versatile, and will endure years of heavy use. It's a great option for storage of heavy, toxic or "messy" materials, such as paints, inks or chemicals. Remember, the lower the gauge, the stronger the steel. Hardwood is highly durable, resilient, and can blend into just about any décor. It tends to be heavier than steel or laminate. Laminate is budget-friendly, easy to clean and light weight. It's not the best option for chemical storage or very heavy materials. It's often available in a variety of colors. There are a number of different door styles to choose from – think about which style works best for your space. Solid doors are best for maximum privacy and security, and are more durable than mesh or clear glass doors. Clear doors allow you to keep an eye on valuable items, but still lock for add security. Typically, clear doors are glass or plastic. Mesh metal doors are strong, see-through, and a great option for science labs. Cabinets with no doors are a fine option if theft isn't a concern, and if you plan to store items that won't fall during transit. Cabinets can come equipped with adjustable shelving, open cubbies, or shelving of various shapes and sizes. Adjustable shelving allows for the most flexibility, while open cubbies are a great option for early learning classrooms, as they're easily accessible to little ones. Take inventory of the items you need to store before make a purchase, and check the cabinet's weight capacity as well. If you need more work space, consider a desk height cabinet, which can often double as a work surface. Be sure the casters on your cabinet lock to prevent it from rolling on uneven surfaces, and look for things like heavy-duty hardware and bolt-through or welded construction, which will ensure your piece stands up to daily wear-and-tear.